It is also a mandatory step for projects willing to enter the [https://polarsys.org/wiki/Maturity_Assessment_WG PolarSys Maturity Assessment], as the analysis process relies on code metrics extracted by SonarQube. [http://www.sonarsource.org/ Sonar] is an open-source product which is used to gather several metrics about code quality, put them all in a single dashboard, and provide some tips to help you making your code better, more sustainable, more reliable, less bugged. [https://www.sonarqube.org/ SonarQube] (formerly known as Sonar) is an open-source product which is used to gather several metrics about code quality, put them all in a single dashboard, and provide some tips to help you making your code better, more sustainable, more reliable, less bugged. SonarQube can be found on https://sonar.eclipse.org . 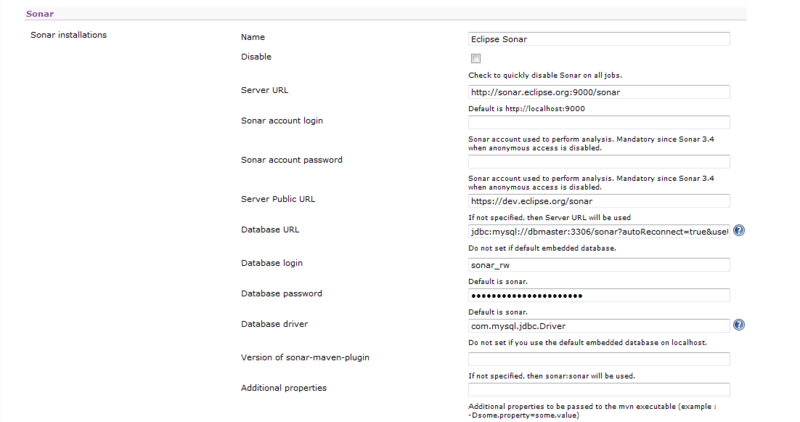 [https://sonar.eclipse.org/all_projects Several projects] already have quality reports enabled. You can drill-down on code to see SonarQube annotations on each class, or navigate through the different widgets on the dashboard to focus on specific issues. The project must have a [[Hudson|Hudson instance]]. See [[Hudson#Requesting_a_HIPP_instance|how to get a dedicated HIPP]]. You should first setup a normal build to make sure the project compiles correctly. Optional: it may be a good thing to add a SonarQube goal in your pom.xml, so you can run the SonarQube analyser whenever you want, independently of the Hudson build. There are two ways to setup SonarQube on Hudson for your project, depending on the build tool used: Tycho builds can use the SonarQube/Maven integration, while other tools (e.g. Buckminster) have to setup a SonarQube Runner build step. The only prerequisite for this method is to use [https://eclipse.org/tycho/ Tycho] as a building tool, which allows to automatically retrieve all information about the build and its dependencies. A dedicated job has to be defined for the quality analysis -- because you don't want to execute SonarQube every time the project is built. In the update center, install the Sonar plugin and restart the Hudson instance. In the job configuration, check the SonarQube post-build action, click on advanced and fulfill the fields according to your project configuration. The following example screenshot shows the [https://hudson.eclipse.org/emfcompare/job/master-quality/configure configuration used by the emf-compare project]. Then [https://bugs.eclipse.org/bugs/enter_bug.cgi?product=Community post a new bug entry in the community bugzilla] to ask an administrator to add the Eclipse SonarQube instance parameters to the Sonar plugin. * The Sonar plugin MAVEN_OPTS option have to be empty. The other way to setup SonarQube is to use the Sonar Build step, which executes SonarQube Runner. In this case, some information needs to be provided manually for the configuration of the SonarQube analysis (in comparison with the previous section, Tycho provides this data automatically). Then [https://bugs.eclipse.org/bugs/enter_bug.cgi?product=Community post a new bug entry in the community bugzilla] to ask an administrator to setup the SonarRunner plugin. See http://mickaelistria.wordpress.com/2012/10/08/sonar-at-eclipse-org/ . You'll need a Tycho-based build, and a Job on [[Hudson]] sandbox to be able to push reports to Sonar. SonarQube is currently (and will remain) public to all and by default only Eclipse Webmaster can administrate the analysis projects. If you need admin permissions on some analysis projects, drop a bug on [https://bugs.eclipse.org/bugs/enter_bug.cgi?product=Community&component=Sonar bugzilla], specifying which analysis projects you want to administrate. The name of the analysis must be close enough to the project's name. If you are not the project lead your project, don't forget to ask him to +1 your request. The admin permissions will be granted for all committers on the project. Sonar is currently (and will remain) public to all, but only an admin can log it. So it's not yet possible to store user preferences or be made an administrator on a project. Follow bug [https://bugs.eclipse.org/bugs/show_bug.cgi?id=391343 391343] for more details. The initial documentation referenced Mickael Istria's blog entry at http://mickaelistria.wordpress.com/2012/10/08/sonar-at-eclipse-org/ . The information in it regarding the Eclipse process is outdated, but the article is still a good reading to understand how SonarQube works and what it can bring to you. SonarQube is installed on a VM accessible from inside Eclipse infrastructure. The database is made accessible from Eclipse.org servers and has a user for SonarQube, and another user for Hudson. When running the Hudson Sonar plugin, the plugin uses this user to push to the SonarQube database the metrics about your project. * July 2013: Got an OutOfMemory on Sonar side while running Platform-Sonar job. Increased max memory in conf/wrapper.conf and restarted Sonar. It is also a mandatory step for projects willing to enter the PolarSys Maturity Assessment, as the analysis process relies on code metrics extracted by SonarQube. SonarQube (formerly known as Sonar) is an open-source product which is used to gather several metrics about code quality, put them all in a single dashboard, and provide some tips to help you making your code better, more sustainable, more reliable, less bugged. SonarQube can be found on https://sonar.eclipse.org . Several projects already have quality reports enabled. You can drill-down on code to see SonarQube annotations on each class, or navigate through the different widgets on the dashboard to focus on specific issues. A dedicated job has to be defined for the quality analysis -- because you don't want to execute SonarQube every time the project is built. In the update center, install the Sonar plugin and restart the Hudson instance. In the job configuration, check the SonarQube post-build action, click on advanced and fulfill the fields according to your project configuration. The following example screenshot shows the configuration used by the emf-compare project. Then post a new bug entry in the community bugzilla to ask an administrator to add the Eclipse SonarQube instance parameters to the Sonar plugin. The Sonar plugin MAVEN_OPTS option have to be empty. SonarQube is currently (and will remain) public to all and by default only Eclipse Webmaster can administrate the analysis projects. If you need admin permissions on some analysis projects, drop a bug on bugzilla, specifying which analysis projects you want to administrate. The name of the analysis must be close enough to the project's name. If you are not the project lead your project, don't forget to ask him to +1 your request. The admin permissions will be granted for all committers on the project.